I think I may have miscounted...I believe the last session was session 5, not 4. The now named lab ship, the Anomolies Run, along with the Axion class freighter and two Mercy class rescue ships, arrive and land safely at Iac's Downport. The port is fairly large, but the two ships are on adjacent landing pads and well within walking distance. Although the thin atmosphere does not allow for a lot of activity until the Travellers acclimatize. There is the faint smell of creosote as they meet Captain Mary Sally, or is that Sally Mary, at the cavernous cargo lock of the Cytec trader. She vaguely resembles Seven of Nine from Voyager - she does have some implants that are visible. Thanks are again given and one of the more heavily augmented crewmen bring out a crate of 50 bottles of Deerian wine. Each bottle is worth about Cr150, so about Cr7,500 for killing the devious space rats. It may also be useful for bartering or trading later. 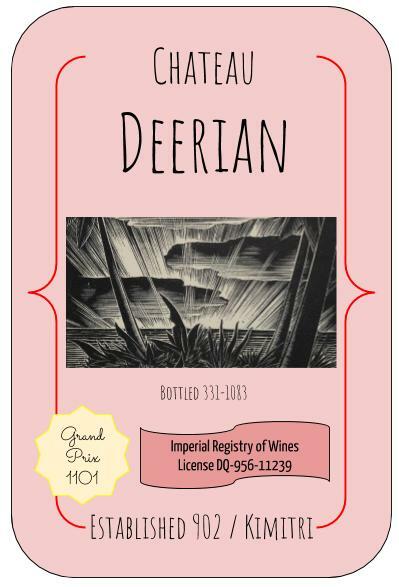 I'll have to work up some more info about Deerian Wine, but I did make a simple label for it. Apparently it won the Grand Prix in 1101, and the bottles they have are about 20 years old, close to reaching their peak value. There was a somewhat length conversation - the Cytec are wanting to achieve the Singularity, and so are becoming more intertwined with their computer systems. They are starting to add computer systems to themselves, and most of their ship systems are a virtual or augmented reality. These systems are like the Zhodani psionic controls: without the right stuff, not operable by non-Cytec enhanced people. Although there are some safeguards and manual processes. Fortunately, Max's TL 15 suit has built-in VR and augmentation abilities and, as per the last update, managed to interface with that ship's system. Osrum, honest soul that he is, also started talking about Planet Bob. While on a somewhat secret mission to Pax Stellar, few people outside of high Imperial offices know the reality of why those worlds are red zoned. His fellow Travellers had a somewhat heated discussion on this until Sabsawa stuck her head outside of her cabin and mentioned that perhaps now would be a good time to register the ship officially and set up the itinerary for the next leg of their journey. Shenna came up before they left, and gave Morgana a shopping list. She and the crew were getting a bit tired of the Navy food that was supplied, and having a Steward-1 skill, does like to cook and would try & make things a bit better for the crew. Sabsawa was going to stay in her stateroom and see about brokerages and cargo they could possibly carry for some profit. The dry air of Iac does not sit will the her Bwap skin. Getting onboard a port transport bus, they get driven around the multitude of warehouses and other ships to get to the large administration building. There, they attempt to enter their official next destination and the clerk, knowing that the world is a Red Zone world brought in his manager. After verifying that the crew knew that the next port of call was well within an Imperial Navy Red Zone, he entered the information and wished them well. He was also very curious as to why but Osrum only asked about nearby parks. About to leave, they are approached by what appears to be a young urchin. She had overheard that they were needing to get into town to get a better variety of goods that were offered at the port. Her uncle, she claimed, had an excellent grocery and restaurant business. And she knew a driver... However, the group decided to rent a taxi for the day, having been around the ports more than once before. They left and picked up the additional groceries and supplies as listed, and went back to the port. Shenna and Oeg met them at the main area in his pristine 1094 Ling air raft, and as the ship engineers headed back to the ship, the Travellers got a hotel with extensive bath facilities. And G+ is going way very soon. I'll miss that little alert thing for when people read my posts...I'll still be posting here on a fairly regular basis. But I won't be joining yet another group thing. So please check back once in a while, and I do post over on COTI (one of the sites listed on this blog). Thanks, Craig, for posting these session summaries. They not only remind us of what we did last time we met, they also make our somewhat eccentric sessions seem goal directed, and they're a lot of fun to read. I think I'm hooked. I am reading these too.Osrum never mentioned he was from Bob while outside the crew circle. Only when Iva brought up him being too honest and therefore gullible. Maybe nOsrum will write a book about his adventures. "Gullible's Travels"